It’s hard not to find interesting things to write about when thinking about travel in Mongolia. Just peel back to Genghis Khan and update from there. Nomadic people, stepped topography and spectacular wildlife all make our top ten Mongolian factoid list. In building the world’s most far flung empire, Genghis Khan’s troops killed an estimated 40 million people in the 13th century. The effect cooled the planet eliminating roughly 700 million tons of carbon in the process. But Genghis balanced the demographic scales to a small degree by having lots of children. About 8 percent of Asian men today have his DNA. Genghis Khan’s grandson Kublai Khan conquered China but also put the Mongolian horse to good use establishing a postal pony express. The sophisticated delivery system was so efficient it was used until 1949. In a nation where there are still ten times more horses than people, it also made sense. Today’s smoky capital city of 1.3 million was originally established as a movable monastery and was relocated 28 times. It finally came to rest in 1778 at a prime water source, the confluence of the Tuul and Selbe Rivers. There are no doorbells on Mongolian gers (nomadic tents) because they are not necessary. Nomad hospitality dictates that you just walk in and the host offers food and lodging – no questions asked. Visitors are obliged to bring simple gifts in return. 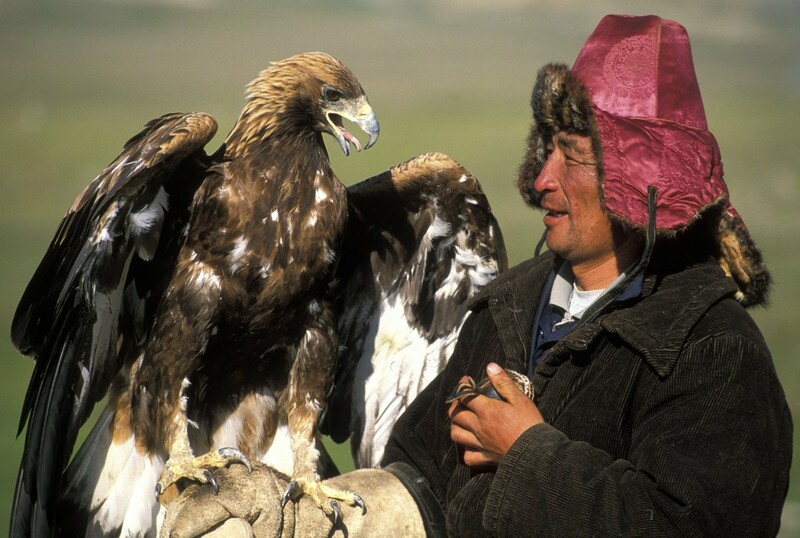 Ancient Kazakhs hunted fox and marmot with golden eagles, and around 400 Mongolian Kazakhs living around the Altai Mountains still do. After a five year training period with son, father and eagle, the bird is taken up to the highest peaks and sent off to hunt. The birds are set free years later and returned to the wild. Silk Road caravans during Marco Polo’s day used Bactrian camels. These large double-hump beasts could handle the cold and altitude and today two million have been domesticated while another 800 roam freely in Mongolia’s Gobi desert which is the largest in Asia. A third of the world’s snow leopards reside in Mongolia’s mountains. There are between 500 and 1000 in Mongolia whose snow leopard population is second only to China’s. They are rarely seen and do not roar or even purr. 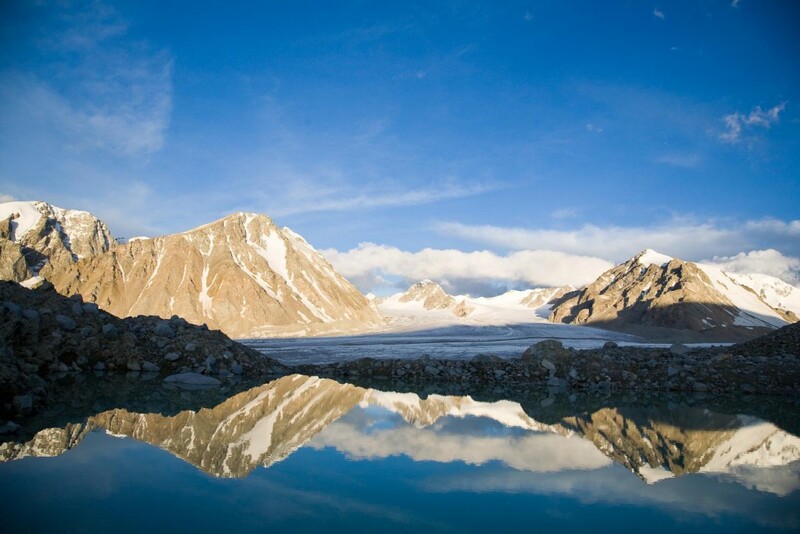 Mongolia’s highest peaks the Altai Tavn Bogd mark the borders of China, Russia and Mongolia. They also form a bowl in which the Potanin Glacier spreads below the majestic peaks for 14 kilometers. It’s Mongolia’s largest glacier, but is melting fast according to climate scientists – 1.5-m a year. Tusker clients see that for themselves on the Tusker Mongolia Trek, as they set up camp adjacent to the glacier. Mongolia’s stock exchange opened in 1991 in the former children’s cinema building. By 2006 it remained the smallest exchange in the capitalist world at just $83 million. After 121 percent growth in 2010, the world’s best, Mongolia has become a capitalist sleeping giant with a market cap of over $2 billion and over 330 companies being traded. With its 3 million people spread out over 1.564 million square kilometers, Mongolia is the least densely populated independent country in the world. That fact may be one of the best reasons for adventure travelers to see it in all its untamed beauty.